Kirby: Right Back at Ya! – I’ve now watched almost every episode of this anime (there were a few I couldn’t find online). It aired in Japan as Kirby of the Stars from October 2001 to September 2003, a period when it appears that no new Kirby games were released other than a remake of Kirby’s Adventure. It began airing in North America in 2002, in a dubbed version with new music and some content edits. Kirby is the main hero, but since he doesn’t talk (other than “poyo” and occasional other sounds), it’s often an original character with the show, Tiff, the daughter of the Prime Minister of Dream Land, who’s often the major focus. She’s a lot like Lisa Simpson, one of the smartest and most conscientious characters, but sometimes seen as annoying due to her tendency to lecture. She even has a brother who’s a troublemaker and more popular, although, unlike Bart, Tuff is the younger sibling. The main villain is King Dedede, who, like in the games, is often more a selfish nuisance than truly evil. He’s largely a tool of Nightmare, the main antagonist in Kirby’s Adventure, who here runs a company called Nightmare Enterprises, or NME. While usually unseen, Nightmare sells monsters to Dedede through a sleazy salesman (apparently he was more polite in the Japanese version), hence both allowing the monsters to ravage Dream Land and make money doing it, although Dedede usually tries to get out of paying his bills. At first he orders them specifically to fight Kirby, but later starts buying them for fairly mundane purposes. 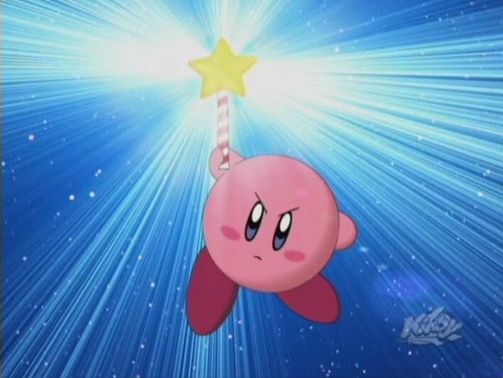 Kirby is a Star Warrior, an elite group who fought Nightmare and his monsters, most of whom were killed off. He’s very young and unpracticed, but has great natural ability. Meta Knight, one of the few surviving veteran Star Warriors, serves as a sort of mentor, but this often involves challenging him instead of being totally straightforward. The Kirby series often has characters serve sometimes as enemies and other times as allies, and the series reflects that to an extent. Most of Dedede’s subjects are Cappies, enemies in the games who wear mushroom caps and grant no abilities. They don’t wear the caps in the show, but they do have the hollow eyes. In the manner of many other cartoons, the Cappies have various occupations around town: mayor, police chief, bartender, mechanic, shopkeeper, fortune teller, archaeologist, etc. Most of them get their time in the spotlight at some point. Also living there is Chef Kawasaki, who first appeared in as a miniboss in Kirby Super Star who wanted to cook Kirby but later was usually a good guy, owns the only restaurant in Cappy Town. He’s a notoriously bad cook, with only Kirby usually liking his food, yet there are episodes where Tiff and Tuff work to save his restaurant despite disliking his cooking as much as anyone else. He is tricked into trying to cook Kirby in one episode, but doesn’t go through with it. And Kabu, a statue enemy, appears as an ally who stores Kirby’s Warp Star when he isn’t using it. What’s kind of weird is that he talks quite a bit in the first few episodes, but later on rarely says anything other than “Warp Star!” The animal friends from the Game Boy games, Rick the hamster, Coo the owl, and Kine the fish, make occasional appearances as well, with Kine having a perpetual crush on Tiff. Another major character not from the games is Dedede’s sycophantic assistant Escargoon, an anthropomorphic snail. I understand Escargoon and the NME Sales Guy would both later appear in Kirby Mass Attack, along with the less frequently appearing Chef Shiitake and Max Flexer, the latter of whom was a parody of Richard Simmons. Plots often center around a new trend coming to Dream Land, which seems to be behind the times in many respects. Others focus on a new character visiting Cappy Town, or Dedede coming up with a scheme that’s either intentionally or unintentionally destructive. Pretty much every time, there will be a fight scene between Kirby and a monster from Nightmare Enterprises. He’ll generally defeat it by inhaling its weapon and using it against the monster, which doesn’t seem like it would always be that effective. This is actually addressed at least once, when he needs to use something other than ice against an ice dragon. 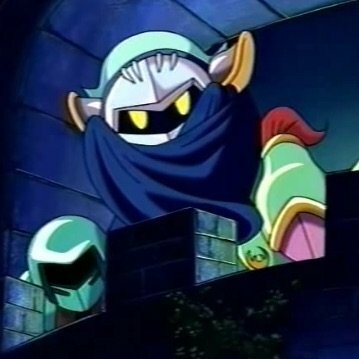 In the finalé, which is a few episodes long, Meta Knight leads a strike force against Nightmare and NME in his spaceship, the Halberd, while Dedede and Escargoon constantly switch sides depending on which seems more likely to save their own hides. It’s also the only appearance in the show of the Star Rod. The voices in the dub are worth mentioning, as the characters often have accents that don’t necessarily make a lot of sense. Meta Knight has a Spanish accent and is often accompanied by Spanish guitar in the soundtrack, possibly a reference to Zorro. Sword Knight and Blade Knight sound Scottish, Sir Ebrum English, and Rick Australian. Kawasaki’s voice is an Ed Wynn impression, Escargoon sounds like Paul Lynde, and Lady Like’s voice seems to be based on Eva Gabor. Dedede has a Southern accent like Foghorn Leghorn, and uses a lot of malapropisms in his speech. Considering that he also drives around recklessly in a tank and wants to cut down the forest to make a golf course, I can’t help but think the voice might have been at least partially inspired by the President of the United States at the time. Also worthy of note is the occasional use of 3D computer animation, primitive by today’s standards but probably impressive when it first aired. There doesn’t always seem to be any particular reason for it, either; characters will switch between animation styles in different shots. The theme song is a catchy swing number, and totally different from the original Japanese one. This entry was posted in Cartoons, Kirby, Monsters, Music, Television, Video Games and tagged chef kawasaki, escargoon, king dedede, kirby mass attack, kirby of the stars, kirby right back at ya, kirby super star, kirby's adventure, meta knight, nightmare, nightmare enterprises, star warriors, waddle dees, waddle doo, warp star. Bookmark the permalink.